Archbishop Diarmuid Martin ponders implications of Irish people’s expressed concern that the celebration of Christmas has become too commercial. Archbishop Diarmuid Martin in St Mary’s Pro-cathedral, Dublin. (Pic John Mc Elroy). 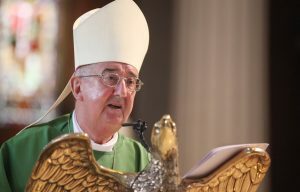 Modern Ireland has an identity crisis about how it wishes to understand Christmas, Archbishop Diarmuid Martin of Dublin said in his Christmas homily at St Mary’s Pro Cathedral. He recalled a recent Dublin newspaper article that referred to a nation yearning for meaning at Christmas and which noted that 86 per cent of Irish people questioned in a survey believe that Christmas, the celebration of the birth of Christ, has become too commercial. The piece also found that the amount spent commercially this Christmas has gone way beyond previous years. He added that paradoxically much of what is now celebrated commercially draws heavily from elements that are inherited from the Christian tradition. “The Christian idea of the celebration of the birth of Christ was never just about what happens in Church, what is beautifully celebrated in carol services or liturgies like ours this evening. While some would celebrate Christmas in their own way without any reference to God and some would celebrate Christmas with the intention of telling God he has no place their lives, others would actively try to remove public mention of Jesus at Christmas “as if the story of his birth constituted a public endangerment”. Then there were practising Christians who will betray the real Christmas by the way they live. “The Church as an institution hosts wonderful charitable organisations that really blossom at Christmas, yet it also hides within its history a shameful failure to protect children and the vulnerable,” Archbishop Martin acknowledged. He told his congregation that many of those who celebrate Christmas without God may do so because they have a false notion of God, while many of those who celebrate with all the frills of religion may also be celebrating the wrong God. Referring to the daily stories about homelessness, immigration, poor education and inadequate healthcare “as problems that scar our society”, he said the Christmas message must draw us beyond just discussing concepts and spinning statistics, towards encountering people. “We are talking about people who stand this night on the edges of our streets and housing estates. They are part of our urban landscape. We know that they are there, but do we really know them personally?